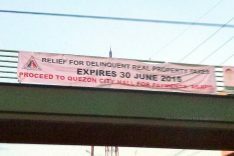 I saw this Notice To The Public being posted outside the Real Estate Division of the Quezon City Treasurer’s Office a couple of weeks ago when we filed for the real property tax clearance for a property of a client. I have finally found time to scan the list and upload it here. Check it out below. The notice to the public states that declared owners of the tax delinquent real properties were served a copy of the Notice of Delinquency, but these were returned because of refusal of acceptance, they have already moved-out, the ddress cannot be located and/or change of address. 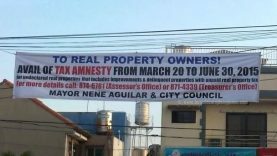 Through the notice to the public, Quezon City Treasurer Edgar T. Villanueva advised real property owners on the list to settle their real property taxes to avoid the inclusion of their properties in the public auction on May 15, 2014. What if you don’t have enough money? 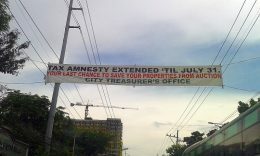 If you don’t have enough money to pay for your real property tax arrears in full, it’s worth trying to negotiate, just like what Mr. Leo of Quezon City did, and according to his comment below, he was able to get his property off the list of those for auction on May 15 by paying what he can afford, and he will pay the balance on a staggered basis. See his comment below. Of course, no one can be certain about anything as other people’s results may vary, but there’s no harm in trying right? The scanned copy of the Notice to the public from the Quezon City Treasurer’s Office can be downloaded below. Keep in mind that this is a very big list and is 13.7 MB in size so please be patient when downloading. para mabili ang isang property, dapat ay yung nakapangalan sa titolo ang kanegosasyon mo,. 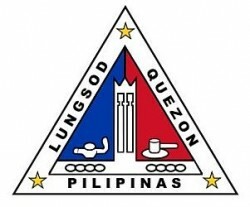 hindi malilipat sa pangalan mo ang titolo kung wala kang deed of sale na pinirmahan ng taong nakapangalan sa titolo. ang isang taong nagbabayad ng amilyar ay hindi patunay na siya ang nagmamayari ng isang property. Agree, thanks for the reply Ivan! Hi Jay, just a heads up. I heard that the next auction is scheduled on November? Did you acquire the latest listing? Hi Leenard, I highly suggest you negotiate for a longer payment term, while paying what you can upfront. Good day Sir Jay, what if i am the one who is occupying the said property that will be foreclosed as a tenant. but i received the second letter of delinquency. can bid for the said property? please reply sir! thank you! Yes Ms. Nefulda, you may bid on the property. 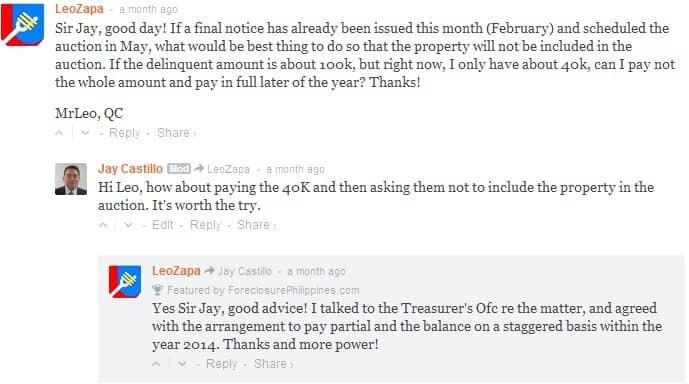 Hi Jay, I’ve heard about tax delinquent properties bought on auction from a friend whose friend was able to win in the bidding. I’ve been interested ever since and only now considering joining the auction seriously. My question is, if the declared owners are known real estate developers, would it be difficult to have them ejected or will it be an exercise in futility since they can easily redeem the property within the redemption period? Hoping to get enlightenment on this issue. Thanks for a great and very informative site! Does it need the bidder to be present during the auction? 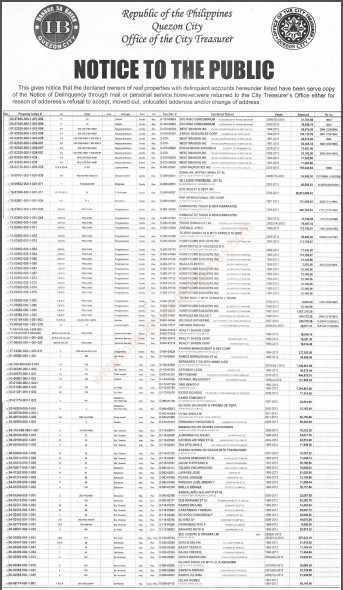 My sister and I are new in reading the list for auction on May 15, 2014 (QC tax delinquent). And we got interested in some of the properties to be auctioned. The “AMOUNT” stated means it is the amount the owner should settle to be not included in the coming auction not the amount we can invest buying the property right? How/ where can we know how much is a certain property already foreclosed? Or if you can give us guidelines on step by step procedure (people or office) on how to acquire a foreclosed property. I saw this list in the newspaper a few weeks ago. I marked off the properties located in our subdivision and went around to check what they looked like. Turns out all of them are still occupied, with no indication whatsoever that the occupants/owners will be leaving anytime soon. Yes, you can expect majority of the owners of the listed properties here will not leave and they will settle their real property taxes before the auction, which I believe is the intention of the Notice issued by the City Treasurer (remind owners so they can pay their taxes), which is also how I presented this post. I’m aware that it was a reminder and not the actual auction list, but I went to look at the properties anyway out of curiosity. I was surprised with what I saw because I was expecting to see abandoned/dilapidated houses. Say for example that I want to make an offer on an abandoned property; where/how can I find information about an its owner/title if all I have to go on is the property’s address? 1. 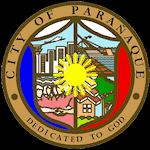 With the address, go to the tax-mapping section of the city/municipality. 2. Ask them if they can trace who the owner is. 3. When they find the property’s owner, get the tax declaration number, etc. for further checking. 4. From the tax dec, you can get the TCT/CCT number. We’ve done this several times for properties for sale and the seller/broker refuses to give us a copy of the TCT/CCT which we need for due diligence. I’am new to real estate, What does this auction mean? you can bid for the property starting with the price indicated in the listing? The list shows some very enticing properties and I am having a hard time believing how cheap some of them are. If, for argument’s sake, I came out to be the winner of one of the properties I had my eye on, does it mean I am the rightful owner of the property? Can I legally occupy this property? Can I sell this property? What are my rights and legal bounds as far as winning this auction is concerned? Same question from here Mr Jay. Sorry I did not include any details on attending the auction itself as this post was meant as a reminder for those on the list to settle their real property taxes so they can prevent the foreclosure of their properties. 1. The prices are cheap because you only have to pay the arrears in taxes, interest and surcharges, which is just a fraction of the market values of these properties. 2. When you win in the auction, you will be given a certificate of sale, but you will have to respect the 1-year redemption period. If the owner redeems the property, the winning bidder usually gets 2% per month as interest based on the winning bid price. 3. After the 1-year redemption expires, you will be the rightfull owner, but you will have to eject the former owner. After you have transferred the property to your name (you will have to go through the courts as part of the process), you can sell the property. Thank you very Mr. Jay. for your reply. The link was also very helpful in explaining what we need to expect and the overall view of the process. 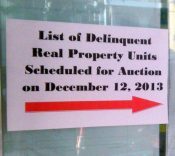 After reading that the delinquent owners might not vacate the place easily and that it could require a court eviction to eject them, which could take years, I immediately felt intimidated. I realize that although the prices were tempting, acquiring tax-foreclosed properties is never a walk in the park. This guide is very informative and can prepare someone who wants to go down this road. I may try my hands on tax-foreclosed properties in the future but as you have said, arming yourself with information is the best defense you can get.